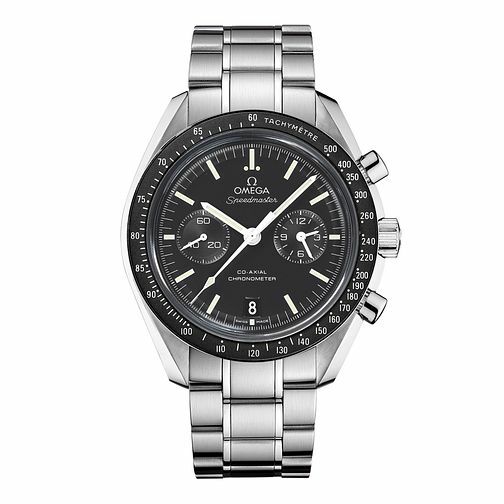 Omega Speedmaster Moonwatch men's stainless steel bracelet watch featuring large black date dial, self-winding chronometer and co-axial escapement movement. Omega Speedmaster Moonwatch men's bracelet watch is rated 5.0 out of 5 by 1. Rated 5 out of 5 by Anonymous from An Icon updated OMEGA's most famous watch and an icon of the Space Race, the Speedmaster Professional, has always been a watch I admired but never wanted to own until this watch was introduced. It has the co-axial cal. 9300 automatic movement which means unlike the Professional it does not need to be wound every day. It is not a replacement for the Professional but a complimentary range. The watch is very accurate, has an updated 2 register chronograph dial that can still measure up to 12 hours and retains the iconic look of Professional with modern technology. It is expensive but the movement inside the watch is an in house "manufacture" movement and can stand comparison with similar watches from other makers such as IWC, Rolex and Zenith. With the Silicon Balance and co-axial escapement it is arguably a more advanced movement than any competitor. Taking that into account although it is expensive it is worth every penny. After years of wanting a Speedmaster I bought this watch as a gift to myself and I could not be happier with it. It is large but very comfortable to wear and the glass display back gives a fantastic view of the movement it also makes it lighter as well and contributes to the pleasure of owning the watch. The service a the Ernest jones OMEGA boutique in Manchester was also superb. Very knowledgeable and enthusiastic staff and so friendly. I will be going back one day for another watch and I would recommend the Manchester OMEGA Boutique to anyone wanting a top class experience of buying a top class watch.